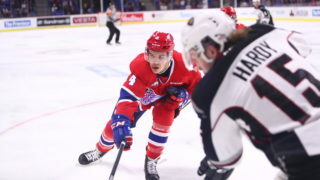 If there was any doubt about the impact forward Kailer Yamamoto could have with the Chiefs, it’s gone now. 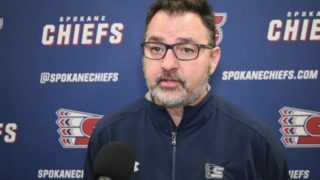 Yamamoto scored once and added three assists for a four-point night in his first game back with Spokane since being reassigned by the Edmonton Oilers earlier this week, leading the Chiefs to a 6-3 win over the Lethbridge Hurricanes on Friday night. Lethbridge got on the board first, taking a 1-0 lead just 6:45 into regulation as forward Jake Elmer roofed a perfect shot over Dawson Weatherill’s left shoulder. 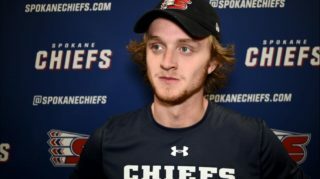 The Chiefs responded quickly, with team captain Tyson Helgesen slapping home his second goal of the season off a Lethbridge defender less than a minute later to make it 1-1, with assists to Ty Smith and Yamamoto. Spokane took their first lead of the night with just over five minutes left in the opening period, taking advantage of a Tate Olson tripping penalty to score on the power play. Yamamoto served up a perfect backhand pass across the offensive zone to a waiting Jaret Anderson-Dolan, who one-timed it past Oilers goalie prospect Stuart Skinner. Eli Zummack picked up his first assist of the night on the play. Zummack added his second assist of the evening while shorthanded at the 17:20 mark, showing patience with the puck to find the trailing Yamamoto, who chipped in his first goal of the season to make it 3-1. Ethan McIndoe, Riley Woods and Jake McGrew got in on the action midway through the second period as McIndoe finished a beautiful tic-tac-toe rush to score his fourth of the season and extend the lead to three goals. After a Lethbridge power play goal by Giorgio Estephan, Yamamoto and friends came right back to push the margin back to three with 33 seconds left in the second. Yamamoto picked up a deflected Nola Reid shot and found Smith at the blue line, from which the second-year defenseman fired a shot through a screen to make it 5-2 heading into the second intermission. Lethbridge kept it close as Ryan Vandervlis beat Weatherill low at the 4:17 mark of the third but the Chiefs clamped down after that. Zach Fischer potted his fourth of the season on a breakaway with 1:38 left to seal the deal and give Spokane the two points. 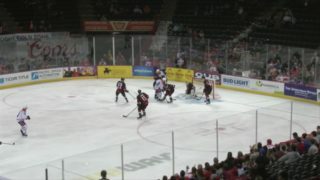 The Chiefs finished the game 1-for-3 on the power play and 7-for-8 on the penalty kill with one shorthanded goal. 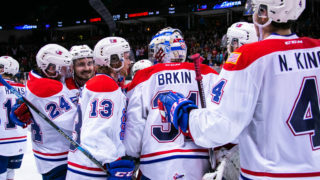 The Hurricanes outshot Spokane 35-33. 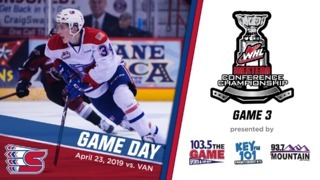 Spokane continues their two-game road trip tomorrow night in Cranbrook to take on the Kootenay ICE at 7 p.m. MT / 6 p.m. PT. Mike Boyle will have the radio call on 1510 KGA NW Sports Talk with the pre-game show starting at 5:30 p.m. PT.